Toddlers and preschoolers love to exert their independence and share their opinions! Exerting their independence can sometimes manifest itself as a giant tantrum about leaving the library, the park, your house, or somewhere else really fun that they like. Recently a Toddler Approved reader asked for help regarding transitions for her two-year-old. Her child melted down into a tantrum after library story time despite warnings that it was time to leave. 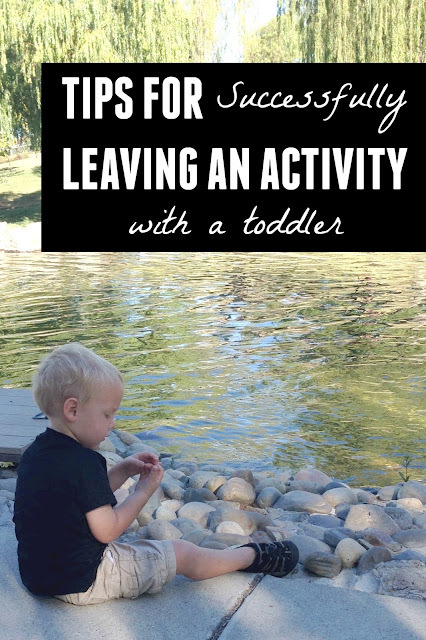 Today I'm going to share some strategies I've used and some other ideas that other readers and parenting experts have used to help make leaving an activity with a toddler successful. To get started I am going to clarify that successful doesn't mean without crying or protesting. My definition of successful is that you and your toddler will leave an activity with your relationship intact and you will successfully set limits and follow through. 1. As a parent it is important to acknowledge your child's emotions when they begin to protest about leaving from somewhere. You can read more about acknowledging emotions in my post sharing my favorite tip for taming tantrums. Going to the park, library, toy store, book fair, etc. is really fun. Letting your child know that you understand it is hard or sad to leave and empathizing with them can do a lot to help. 2. When we are at the park or a fun event I try and begin the outing by setting my expectations and planning for big feelings when it is time to leave. We also try and get ready to leave 10 or 15 minutes earlier than we need to leave just in case there are big emotions. This way we have ample time to deal with them and I don't feel overly rushed or stressed out... which then causes me to overreact or not respond in a helpful way to my child's behavior. 3. Plan ahead and think of a simple transition activity that your child might enjoy after you leave the park (or library or wherever). It might be a snack or special drink in the car... it might be getting to press the button to open the car or help you with a special job with a younger sibling. Often telling my toddler that I will chase him up the hill to the car gets him moving and happy to leave the park because he loves being chased. Each child will be different. Pass along any strategies you use! 4. If you are like me and have more than one child with you most of the time I always make sure to pack light just in case I need to carry someone back to the car. I almost always bring my stroller or baby carrier so that I don't get caught carrying two screaming kids plus a diaper bag and a bike. 5. If you have time, let your children get any big emotions out at the park or as you are leaving and comfort them! Let them know you understand and tell them it is ok to be sad! I have found that by letting my kids move through their big emotions (even though they are sometimes annoying to me), they learn how to "work through them." I let them know that I am not going anywhere and we talk about strategies for calming down (like taking deep breaths and giving hugs). 6. When it is time to leave I always like to give kids choices. "Do you want to walk or be carried to the car?" "Do you want to sit in the stroller or hold my hand while we walk out of the library?" Giving kids some choices helps them feel in control and decreases power struggles. I always make sure to only offer choices that I am OK with. If the child doesn't make a choice in a specific amount of time then I let them know I will make the choice for them. 7. 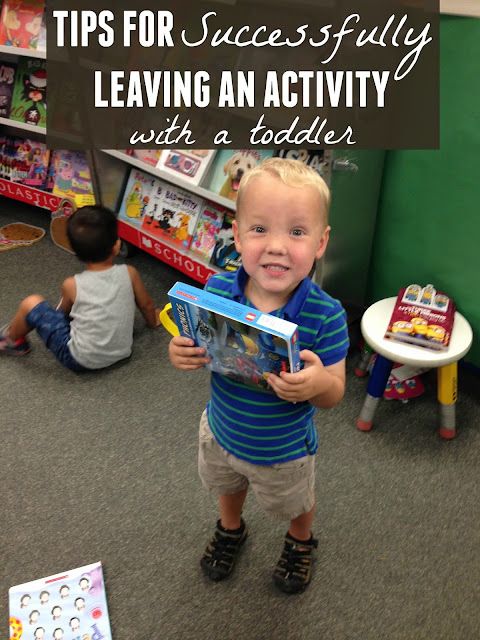 Often when it is time to leave I tell my kids to choose one last activity to do. They can go one last time on the slide or get a drink at the water fountain one last time or whatever. This helps them understand timing a bit and makes the transition a bit more smooth. 8. Lastly the most important tip for successfully leaving an activity is to follow through once you have a set a limit. If you have told your child they can go on the slide one time and then you are leaving... stick to that. If your child hasn't decided if they want to walk or sit in the stroller after ample time to make a choice... put your child in the stroller and head to the car. Your child might protest and then you can kindly acknowledge their emotions while you walk to the car... but you have also set the expectation that you will follow through with what you say. Over time your child will recognize that you mean what you say and push the limits less. Several other Toddler Approved community members had additional suggestions that they use for successfully leaving an activity with a toddler that you can read HERE. What other tips would you add? What are respectful and kind strategies you use to help successfully leave an activity with your toddler or preschooler? Check out more of our favorite Parenting resources on our Becoming a Better Parent Pinterest board. We also have our favorite toddler tantrums resource here. This was well timed as I'm currently going through this with my almost 2 year old. I've found that letting him take ownership of something really helps us leave. I let him push the button on the garage door, hold my car keys, go outside to look at the moon or an airplane keep us all from losing our minds. Thank you for the additional tips. Following through is extremely difficult; it's more difficult than I could have ever imagined. I tell my 2 yr old son it's time to leave, and then together to we walk around holding hands waving bye to the slide, and the swings and his friends as we leave the playground. Doesn't matter where we are this works.